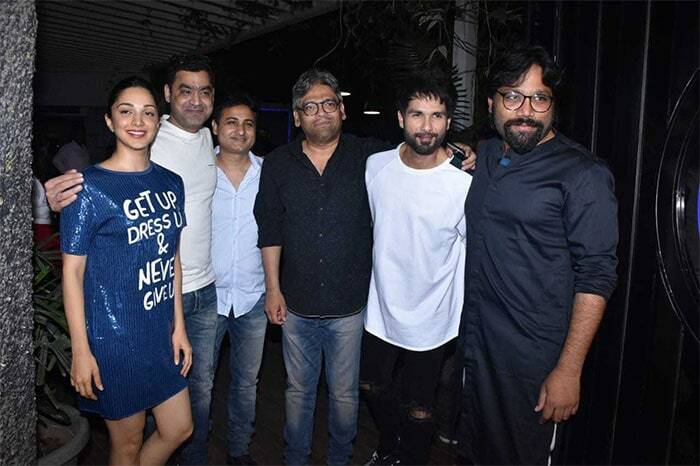 It's a wrap for Kabir Singh, the remake of Telugu movie Arjun Reddy, and the film's stars - Shahid Kapoor and Kiara Advani - were spotted partying at a restaurant in Mumbai after finishing their project. Kiara Advani was seen in a blue sequined shift dress, which she paired with a pair of white sneakers while Shahid Kapoor was smart and cool in a casual white t-shirt and black jeans. The director of the movie Sandeep Vanga and the other crew members were also spotted with the stars in the wrap up party. The paparazzi got a hold on the fun moments that the crew had during the get-together. Take a look at the pictures from the wrap up party of Kabir Singh. Movie-buffs were left really impressed by the teaser of Kabir Singh, which released earlier this week. It was appreciated by Shahid Kapoor's colleagues on social media. Shahid Kapoor's wife Mira Rajput also posted the teaser of the movie on her Instagram and captioned is saying, "Boom! Whattawowow." On Instagram recently, Shahid Kapoor shared his thoughts about playing the protagonist in Kabir Singhand wrote, "As a star one is so conditioned to showcasing oneself at ones best. But as an actor one has to have the guts to show yourself at your worst. 'Kabir Singh' in my blood. Hope you feel him too." In the original version of the movie, Vijay Deverakonda was the lead and actress Shalini Pandey was cast opposite him. Arjun Reddy was released in the year 2017. Last year, in the month of November, the shooting had begun for Kabir Singh and Shahid's first look from the movie sets also had gone viral all over the internet in no time. The movie is set to hit the theatres on June 21, 2019.